At Bauma 2019, Metso is showcasing the expansion of its product portfolio into new territory. 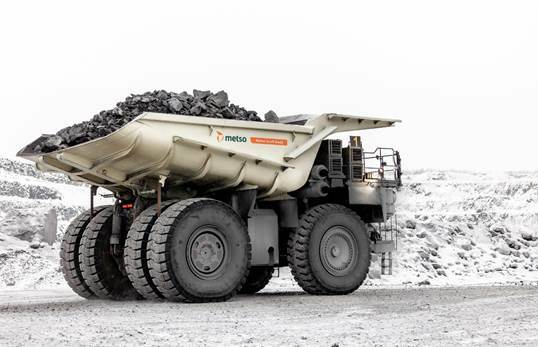 The Metso Truck Body is a groundbreaking innovation that combines the benefits of rubber and high structural strength steel, enabling mines and quarries to haul more with less. The Metso Truck Body is a lightweight, rubber-lined tray designed for off-highway trucks. The elastic rubber absorbs the energy of every impact, preventing it from reaching the frame and thus allowing for a lighter-than-usual, high structural strength steel frame beneath the rubber. Thanks to this, the body can absorb maximum shock at the lowest possible weight. Metso has been supplying its tried-and-tested rubber lining for haul trucks for several decades with outstanding results both in reducing the need for maintenance and improving the working environment for truck drivers. The proven benefits include up to six times more wear life compared to traditional steel lining, half the noise, and 97% less vibration. Our latest innovation, Metso Truck Body, takes this concept to another level by combining the wear protection and working environment benefits of rubber with the payload-maximizing abilities of a lightweight body. "Many mines prefer lightweight truck bodies because they enable the carrying of more payload. However, the problem with these traditional lightweight bodies is their lack of durability - they often have to be replaced in every one or two years, or repaired, which gets expensive," Lars Skoog explains. "The Metso Truck Body provides an unprecedented solution that is both light and durable. The rubber lining and high structural strength steel frame have been engineered in a seamless process, utilizing the best qualities of both materials," he continues. A typical Metso Truck Body weighs 20-30% less than a traditional steel-lined truck body. Depending on the application, this translates into a payload increase of several tons. The Metso Truck Body is available globally for all major off-highway truck models used in mining and quarrying. Several lining options ensure application-specific fit, even in operations that struggle with problems such as carry-back. Discover more at our website. Metso is showcasing a number of innovations for sustainable productivity in the aggregates and mining industries in Bauma 2019. Experience them first-hand and join our team of specialists for one-to-one discussions at booth FS.1111/2. Metso is a world-leading industrial company offering equipment and services for the sustainable processing and flow of natural resources in the mining, aggregates, recycling and process industries. With our unique knowledge and innovative solutions, we help our customers improve their operational efficiency, reduce risks and increase profitability. Metso is listed on the Nasdaq Helsinki in Finland and had sales of about 3.2 billion in 2018. Metso employs over 13,000 people in more than 50 countries.